As many of you guessed on Friday’s ‘Where Are We?’ Instagram, we were at Canalside. Congratulations to Ryan, the winner of last week’s contest and some 43North gear. 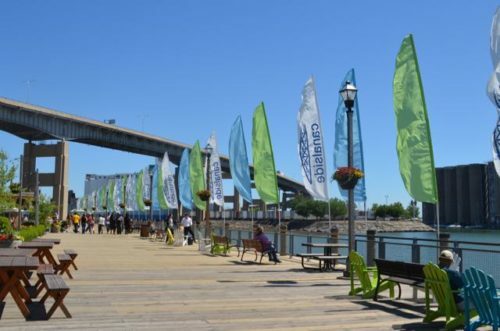 Canalside is a bustling spot on Buffalo’s waterfront: It has transformed into the place to be—the host of concerts, activities, art festivals, businesses, and more. The renovation of Canalside is a reflection of the progress Buffalo as a whole has seen in recent years. Even the grain elevators, abandoned and without purpose, have found new life. While a few are still used as intended by the General Mills plant located in Buffalo—yes, the city really does smell like Cheerios—the remaining mills have been repurposed to serve as the distinct backdrop for a vibrant light display. They’ve since established their role as an iconic piece of art tied to Buffalo, drawing an entirely new crowd. Attracting the attention of even more people are the unique businesses throughout. Whether you’d like to stroll the boardwalk and buy an original piece from a local artist, or you want to ride the Buffalo-built ice bikes, Canalside is the place to be.